This book traces the development of religious comedy and leverages that history to justify today’s uses of religious humor in all of its manifestations, including irreverent jokes. It argues that regulating humor is futile and counterproductive, illustrating its point with a host of comedic examples. Humor is a powerful rhetorical tool for those who advocate and for those who satirise religious ideals. 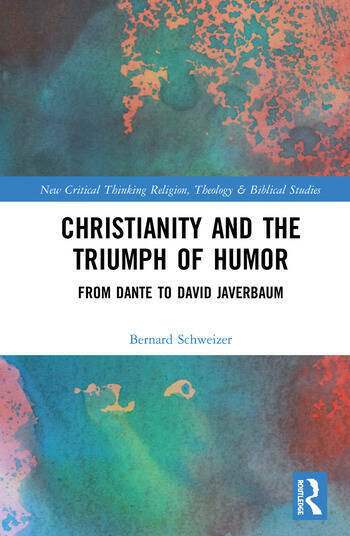 The book presents a compelling argument about the centrality of humor to the story of Western Christianity’s cultural and artistic development since the Middle Ages, taking a multi-disciplinary approach that combines literary criticism, religious studies, philosophy, theology, and social science,　After laying out the conceptual framework in Part I, Part II analyzes key works of religious comedy across the ages from Dante to the present, and it samples the breadth of contemporary religious humor from Brad Stine to Robin Williams, and from Monty Python to South Park. Using critical, historical and conceptual lenses, the book exposes and overturns past attempts by church authorities, scholars, and commentators to limit and control laughter based on religious, ideological, or moral criteria. This is a unique look into the role of humor and comedy around religion. It will, therefore, be of great interest to scholars of Religious Studies, Humor Studies and the Sociology of Religion. Bernard Schweizer is Professor of English in the Department of English, Philosophy, and Foreign Languages at Long Island University, USA. He specialises in Humor studies, Heresy studies, Travel studies and Gender studies and has written multiple articles and books in these areas including, Hating God: The Untold Story of Misotheism (2010).